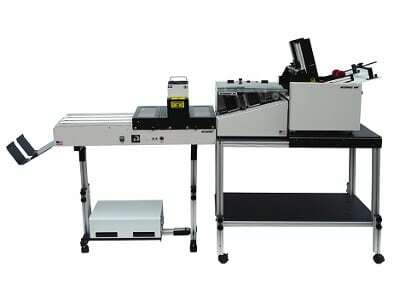 There’s the custom envelop, then there’s the custom envelop printer with more options than you might ever realize you even needed. The Accufast P4 Printer is a great little machine with a lot of big choices to make your mailing campaign exactly what you imagined it could be. Address printers come and go, but what has continued to keep the Accufast P4 Printer in the hearts and minds of its fans are the many options it has for customization. The printer itself isn’t anything to sneeze at either being the best printer for envelopes, with an open throat that allows it to print a wide range of media and extremely tight accuracy, it’ll print any sort of label you need. 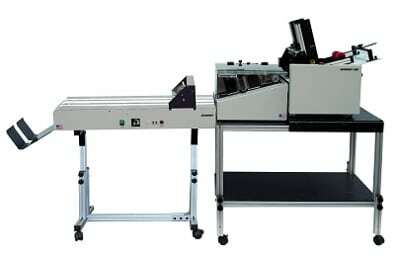 It’s a durable machine, too, with users sending millions of mail pieces through this envelope printer each year. Address printers come and go, but what has continued to keep the Accufast P4 Printer in the hearts and minds of its fans are the many options it has for customization. The printer itself isn’t anything to sneeze at either, with an open throat that allows it to print a wide range of media and extremely tight accuracy, it’ll print any sort of label you need. It’s a durable machine, too, with users sending millions of mail pieces through this envelope printer each year. 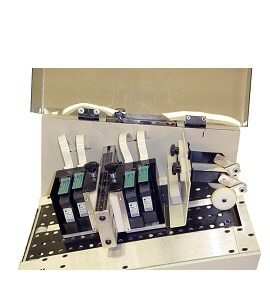 Add-on units include feeders, stands, conveyors, dryers and even a card and tag printing system. Flexibility is the name of the game for the Accufast P4 Printer and you’ll get plenty of it when you add the features you need most to make this unit your own. Measures 16”l x 12”h x 16.5”w; weighs 35 pounds. Adjustable speed of up to 50 inches per second. Requires 120 volts 4 amps 60 hz or 230 volts 3 amps 50 hz. Accepts documents 14.33” long, 3” to 14” wide and up to .375” thick. 2” print area divided into two 1” segments. Windows XP or higher required, imaging software included. Print resolutions up to 600×600 available. Optional drying systems and UV cure inks sold separately. MSRP (with HDF feeder): $9,000 to $12,695.